If your Tibialis Anterior (TA) is weak, what kinds of performance and health issues can you get? It’s a significant factor for foot pronation, plantar fasciitis, achilles tendonitis, shin splints, anterior compartment syndrome, knee pains and lots more. Let’s look at TA anatomy, actions, measurement methods along with the implications weak TA strength can have on your athletic performance and health. Anatomy – The TA muscle is located in the front of your lower leg region. The top of the muscle attaches to the upper 2/3rd of the lateral (outside) tibia. The muscle runs down the front of the shins, connects to its’ long tendon which runs in front of the instep. From there, the tendon continues towards the medial side of the foot, attaching around the mid foot at about the peak of the long foot arch into the 1st cuneiform and the base of the 1st metatarsal bones. Action – The main action of this muscle will be to dorsiflex your foot (pull your foot up) and twist the sole of your foot to face inward (inversion). The quick way to refer to this motion is that it twists your foot up & in. This is one of the key ‘stabilizing’ muscles of the foot. In addition to twisting your foot up and in, the TA is also one of the primary muscles holding up the long arch of the foot. Diagnosis – Weakness in the TA can be determined with manual muscle strength testing, careful observation of ankle movement during walking, running and at rest, long arch height measurements and other tests. Supporting information can be gained through a careful history as well as physical examination for neurological, vascular and orthopedic signs. Detailed measurement of TA ranges of motion and muscle strength are available with specialized equipment such as tensiometers and isokinetic dynamometers when required for insurance purposes, research or in advanced cases. Functional Implications – When the TA muscle is weak, you will not have the strength you should when a) moving the forefoot up & in, b) your ankle will be unstable and c) there will be some degree of difficulty holding up your long arch (excessive foot pronation) when the foot is put under more stress than the muscle can handle. In more advanced weaknesses, the foot will be unable to hold the long arch up during even mild stress such as weight-bearing. With extreme or prolonged weakness, the long arch may become permanently deformed to the flat position (flat-footed) even without weight-bearing. Performance Issues (Arch) – Difficulty in holding up the long arch will have implications in a very large number of sports. Any athlete involved in sports which include running will suffer to some degree. If the long foot arch is fully collapsed, shock absorption will be reduced (depending on what type of foot strike you use). Athletes in sports that require high power outputs in the legs (such as weight lifting and high jumping), with weak TAs, may notice that their knees ‘give out’ or ‘buckle’ medially when under high stress. When joints buckle outside of their normal ranges of movement, reflexes are initiated which severely restrict continued muscle contraction. A weak TA can effectively become the weak link which limits your athletic performance. Athletic Performance Issues (Up & In) – Sports that use the motion of twisting the foot up and in will suffer when this muscle is weak. 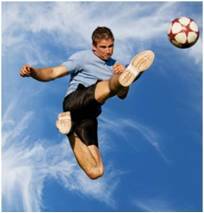 Kicking a football or soccer ball in a forward / diagonal direction is a clear example. While the main power behind the kicking is due to the larger thigh muscles, additional power is also derived from the TA to give you the extra power needed to advance you to the next level of athletic performance. Perhaps more important than the extra power, will be the degree of ball control that is lost in kicking because the forefoot cannot maintain a reliably stable kicking surface. Sports that require agility and rapid lifting of the foot like basketball, volleyball and dance will also suffer. Athletes who need agility with strong lateral movement will be aided by the TA to evade their competitors as in football. The knee deviates medially each time the foot pronates. This leads to stretching of the medial collateral ligament of the knee, knee instability and a wide range of secondary issues such as potential for cartilage damage. Chronic & Severe Weakness – People who experience weak TA issues for many years are putting their feet and knees through excessive wear and tear that can eventually lead to cartilage damage, osteoarthritis and potential for surgery. Advanced weakness of ankle stabilizers can contribute to susceptibility to falls for seniors. Extreme weakness of the TA can contribute to ‘foot drop’ or difficulty lifting the foot up, dragging the toes, an unusual gait and increased tripping. There are other muscles in the foot that contribute to holding the foot up, so typically this will not happen unless there is severe weakness of all of these muscles, which more typically happens when there is nerve damage. Learn manual muscle strength testing through seminars and online through the DxF. Next Next post: Weak Gluteus Max: Tibial Head leads to….